Big U.S. cities1 saw another increase in murders in the first half of 2017, likely putting them on track for a third straight year of rising totals after murder rates reached historic lows in 2014. So far, however, this year’s increase is considerably smaller than it was in each of the past two years; the big-city numbers are consistent with only a modest rise in murders nationwide. 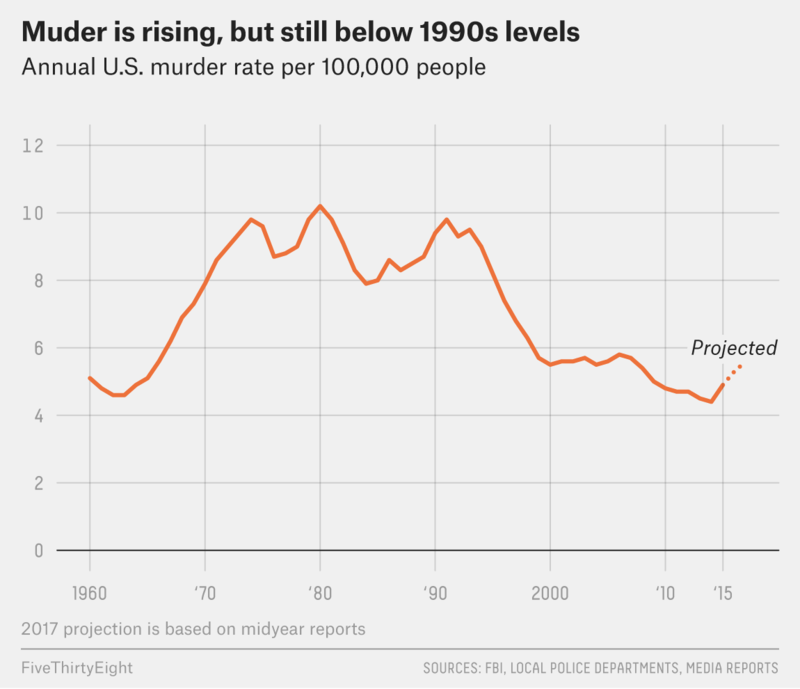 Overall, if recent numbers hold, the nation’s murder rate will likely rise but remain low relative to where it was from the late 1960s through the 1990s. Change in first half of 2017 compared to first half of 2016. What can we really learn from a sample of big-city murder counts from midyear? The FBI has provided preliminary crime counts for the first six months of the year for each year since 2011. That isn’t enough to find any long-term trends, but the patterns do offer some hints about what the big-city sample suggests about the rest of the year. First, there tend to be more murders in the second half of the year, when it’s warmer, especially in northern cities. Between 52 and 54 percent of big-city murders occurred in the second half of the year in every year between 2010 and 2015, according to the FBI’s data.8 So murder rates in those cities will likely ultimately be higher than the midyear statistics suggest. Second, recent history suggests that not only does the absolute number of murders increase in the second half of the year, but the rate of increase also accelerates. The year-over-year rate of change in murder in big cities increased in the second half of each year from 2011 to 2015, regardless of whether murder was increasing or decreasing nationally. In other words, if the overall murder rate was rising, it rose faster in the second half of the year, and if the rate was falling, it fell slower in the second half of the year. In 2015, for example, in the 63 big cities that reported midyear data to the FBI, murder was up 11.8 percent at midyear and 15.1 percent at the end of the year. We can see this second-half acceleration in the FBI’s data for each year from 2011 to 2015 in the table below. Big cities tend to exaggerate national murder trends, both up and down — so a large rise in big-city murder usually corresponds with a slightly smaller national increase. If murder rose roughly 8 percent nationally in 2016 (as my January estimate suggests) and is set to rise a few percentage points in 2017, then the nation’s murder rate in 2017 will be roughly the same as it was in 2008. That’s still more than 40 percent lower than the country’s murder rate in the early 1990s (but roughly 27 percent higher than it was in 2014). Ultimately, this year’s trend is similar to last year’s in that more big cities are seeing a rise in the number of murders than are seeing a decline. There are still six months left in 2017, and while anything could happen, the most likely outcome is that — although this year’s rise will likely be smaller than last year’s — the country will see murders increase for a third straight year. Which here is defined as cities with populations over 250,000 according to the FBI’s 2015 population estimates. The FBI defines murder as “the willful (nonnegligent) killing of one human being by another.” This does not include deaths caused by negligence, accidents or homicides deemed justifiable, such as a killing in self-defense. Big cities tend to exaggerate the overall national trend in murder, as Carl Bialik pointed out last January. We won’t know 2016’s national murder count for a few months, but the murder rate in big cities rose about 3 percentage points more than the the national trend the last three times murder rose nationally, which suggests that an 11 percent rise in murder in big cities will probably correspond with an increase of roughly 8 percent nationally. Twenty-nine cities provided data in response to email requests; 34 cities make their murder data available through a public portal; I used media sources for five cities. Fifteen cities didn’t make their data publicly available and either denied or didn’t respond to requests that they provide it. All murder counts are unofficial until formally submitted to the FBI at the end of the year. Murder rates were calculated using the FBI’s population calculations for 2015. To determine this, I compared the midyear murder counts with the final, year-end data for the big cities in our sample.